Kotaku, in its look back on 2012, will ultimately laud the best games of the year, the qualities that made them great, and those who made them great. But we also want to step back and recognize those who make video gaming, as a whole, great. The people dedicated to the ideals of this culture and whose actions reflect great credit upon it. Here, then, is our list of the Gamers of the Year—those who don't come from games design or publishing (or the industry press). By no means is it comprehensive, nor is it a zero sum proposition. Our choice of the four below doesn't mean that all others in video games' global audience of millions are excluded. Surely, there's someone we've missed. But this is a reasonable starting point. The four below are chosen because they reflect the better qualities, and the better nature, of our leisure pursuit, and the good that may speak for all of us. If you know of someone, or a group, fulfilling that spirit, please nominate them in the comments below. We will later publish a collection of your thoughts on others also deserving recognition as Gamers of the Year. There's probably no greater symbol of the thin line of happenstance separating the ordinary and the unique than what happened to T.J. Brida, a 22-year-old smartphone salesman from Philadelphia who went further into a perfect game than any pitcher, real or video game, in recorded history. Brida was pursuing a berth in MLB 2K12's Million Dollar Challenge tournament with Roy Halladay of his beloved Phillies. He got the 27 outs necessary for a perfect game. But Pittsburgh also held him scoreless, and so the contest dragged to extra innings. As Halladay's stamina drained to nothing, Brida struggled to place his pitches, given only fractions of a second to make complex stick gestures. He made it to the 14th inning, when a slap-hitter bounced a hanging curveball back up the middle, turning one of the most marvelous pitching performances into just another one-hitter in the box score. Brida stood up, turned off the console and went to work. The Million Dollar Challenge would later be exposed as a sham for leaving loopholes in its contest requirements and exploits in its game code. At least one of the contest's eight finalists earned his berth by cheating. But T.J. Brida's honest and remarkable result, flawed though it was in the end, and his commitment to keep playing in the face of an agonizing disappointment, earns him a place among the Gamers of the Year. Lampooned as the hobby of shiftless couch dwellers, video gaming is still fundamentally a physical activity. Alain Poitras' experience in Mass Effect 3 demonstrates this, and it asks all gamers how truly committed they are to what they enjoy so much. Quadriplegic since an accident 17 years ago, Poitras nonetheless had the means and the skills necessary to complete a silver level challenge in Mass Effect 3's multiplayer, by himself, barely missing extraction from the mission. "He soloed silver?!" wrote BioWare's Manveer Heir. "He's 100x more baller than I'll ever be." Poitras touches a keyboard using a long tube held in his mouth and manipulates a touchscreen mouse with the limited use of his right arm. Never did he think of giving up on video games. During his rehabilitation, he immediately headed for the hospital's computer room. A therapist modified some controls for him, and Poitras resumed his pursuit of all video games have to offer. Lest you think he plays Mass Effect only for its multiplayer, remember this. He has finished all three games' campaigns. "ME2 was a nightmare for me because of those 5 dots that you have to link fast to open doors," he said, "But I kept playing it." Alain Poitras' perseverance is humbling to anyone who takes for granted the enjoyment of a video game. The fact he also achieved something few others, of any ability, have the resolve to see through to completion makes him a truly remarkable Gamer of the Year. If Anita Sarkeesian's experience this year is any indication, video gamers must be dragged kicking and screaming to their reckoning of the bigotry, and the facile, comment-culture justification of it, that smears the entire community. And inch by inch, Sarkeesian is doing the dragging, against a hate campaign that would make most give up out of spite. This spring, Sarkeesian had the temerity to ask, via Kickstarter, for $6,000 in funding to develop a documentary series about sexist tropes in video gaming. And they do exist. And her questioning of a culture largely defined by products catering to straight, single males earned her hacking attacks on her email and social media accounts, DDoS attacks on her personal site, a glut of hate speech on the No. 1 site that refuses to lift a finger to do anything about it, and "doxxing," the dreaded ultimate act of terror in online communities. Her enemies even made a video game about her, with Sarkeesian as the ultimate boss to overcome, naturally. Sarkeesian's response was to turn all of this spew back against itself. Rather than ignore the hatred directed at her, she gave it a megaphone and let it be all of what it really is, on stage before an appalled society at large. In spotlighting the rancid ignorance and Rumplestiltskenian tantrums thrown against any who dare question the treehouse culture dominating video games, Sarkeesian earned more than $150,000 for her documentary project. Her fame and moral bearing—wholly made by those who hate her—has brought her to the studios making the same games loved by those who despise her, to ask for her counsel on how to make them better. 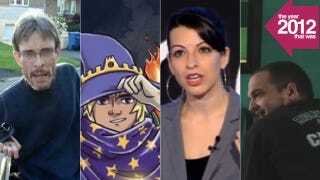 Anita Sarkeesian is one of the Gamers of the Year because opinions are something very easy to express in the convenience offered by Internet anonymity, but the courage to stand behind your convictions, with your name on them, where people know they can find you, is increasingly rare, if not approaching extinction. After Ben Bertoli took his job as a teacher, fresh out of the University of Indianapolis, he arrayed Mario action figures on his desk, stapled 8-bit construction paper sprites to his bulletin board and plastered the walls with images of The Legend of Zelda. A child of the 1990s, devoted to the game culture that flowered in that decade, Bertoli decided he would be the video game teacher. Still, many in his class were nonplussed by his game nostalgia, especially the boys, more accustomed to playing shooters or sports titles. Bertoli resolved to make his classroom experience into one that helped shape his own adolescence: a role-playing game, and give his students something worth striving for. What came out of it was ClassRealm. A gamified achievement system, yes, but one that delivered results. The students spent a good deal of time crafting their in-game personae—vampires, samurai, werewolves, ninja—and then were put up to the tasks of the game. Write. Read. Participate in the discussion. Learn. "The 'Newberry' Achievement, based on the Newberry Medal, can be earned by writing unassigned five-paragraph essays," Bertoli said. "I had 20 essays turned into me the first week. I could hardly get my students to free write when it was mandatory, and now they are churning out paragraphs like their lives depended on it." Bertoli's concept attracted wide notice. Certainly, his principal noticed. Others did, too. "There was a grandmother from Arizona who wrote me," Bertoli said. "She said, 'This is the best thing ever; you're a genius.'" Ben Bertoli is a Gamer of the Year for his work on ClassRealm, and the credit it gives to the medium of video games as a tool for learning. "I hope my students," said Bertoli, "also experience the joy and accomplishment that I feel playing video games every day." We also welcome your own suggestions and citations for gamers of the year, known and unknown, whose work, experience or example reflects the best qualities of video gaming. We will publish your nominations in Kotaku's look back on 2012. Please share your thoughts below.